Take an adventure through the human body with this illustrated book, personalized with your child’s name. The human heart beats about 100,000 times every day. Even more when you're excited, like say, because you're learning astonishing anatomy facts that get you stoked about science. Kids will get excited about learning, too, when they go on an educational adventure with this personalized hardcover book. Each page features illustrations and a story that incorporate your child's name into the plot as Professor Snippet takes readers on a journey through the human body in his miniature rocket. 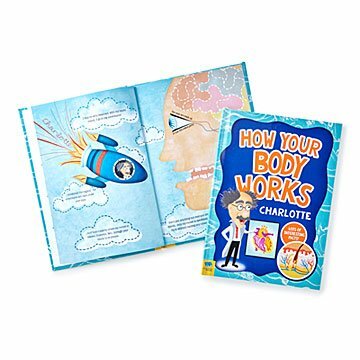 From an explanation of the skeletal system, through the mouth, and all around internal organs, this book gives youngsters a basic understanding of how their bodies work. It's also packed with tidbits that even adults will find interesting as they read aloud to kiddos. To name a few: The longest bone in the body is the femur in your thigh. Your right lung is slightly larger than your left. Reading this book is good for your brain. (OK, we added that last one ourselves, but we have a feeling Professor Snippet would agree.) Made in the UK.